After a tumultuous year you might be asking yourself, “Where can I go to get away?” In 2017, the answer is closer than you might think. Feeling the effects of busy lifestyles, homeowners are expected to take refuge in their own personal sanctuaries. 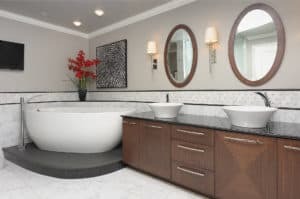 Neil Kelly designers are seeing more home remodeling projects that aim to restore body and mind, incorporating spa-like interiors, soothing colors, luxurious materials, and other amenities. Defined living spaces are returning to modern homes as people seek respite from computers, cell phones, and other sources of stress. 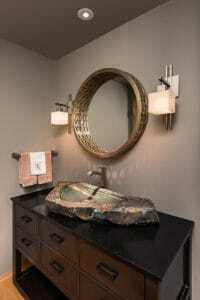 Clients especially want a retreat in their bathrooms (see photo, above). “Our clients are looking for an environment that makes them feel safe, comfortable, and pampered,” says Bend Design Consultant Kathleen Donohue. Hawk points out that building a steam shower or installing a spa-tub can be more affordable too. “You can spend $200+ per month for a spa treatment, or you can spend less than that and have your own retreat without even leaving your home,” she says. 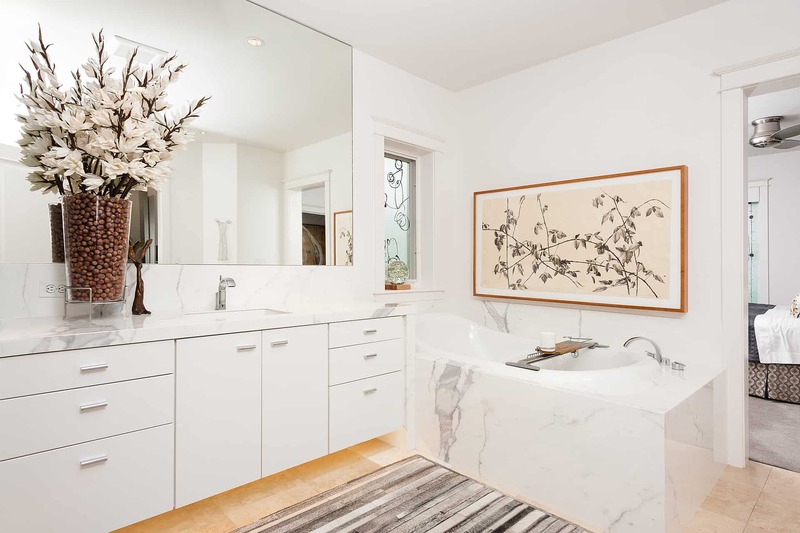 After years of making necessary home improvements, clients are putting more emphasis on luxury — including a bit of fun, whimsy, and functional art in spaces like powder baths. Others are simply looking for more space to put their personal style on display. “We always want to show off for our guests!” says Portland Design Consultant Janel Campbell. Kathleen Donohue noted that clever design elements also add value to smaller spaces. “The use of dramatic materials, lighting, and sculptural forms give these small rooms a lot of punch per square inch,” she says. Lake Oswego Design Consultant Tonya Bellusci is drawn to neutral palettes with rich jewel tone accents. The style known as “farmhouse chic,” or “farmhouse modern” continues to evolve in interior design. The farmhouse approach creates a heightened awareness of our agrarian roots, taking us back to a time when we were surrounded by simpler materials and comforts. Natural textures and patterns in tile, wide plank wood flooring, wood countertops, and farmhouse sinks all contribute to the look. 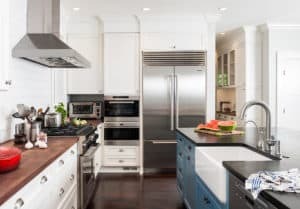 “We want to take advantage of modern conveniences while creating clean lines that are more transitional than traditional,” says Janel Campbell. Photo courtesy of Zenbathworks, zenbathworks.com. Recently, a Portland couple found what they thought was the perfect urban home, but it lacked a private office space and opportunities to exhibit their most cherished collections. 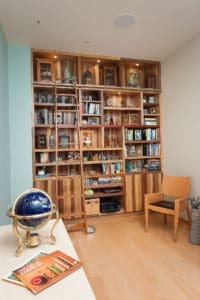 That’s when Neil Kelly Design Consultant Karen Richmond stepped in to help them install a wall of custom bookcases — complete with accent lighting and rolling ladder — providing an abundant display area. 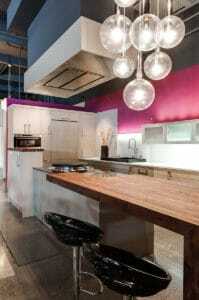 The homeowners’ love of wood led to the use of Jakarta mix hardwoods from Asia, reclaimed from local shipping ports. According to Richmond, taking the time to determine a personal space accomplishes several goals at once. “In defining these spaces not only is individuality honored, the creativity on display has a universal appeal,” she says. 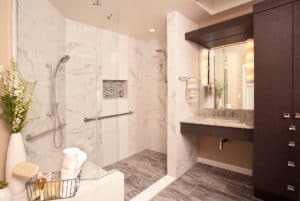 Universal Design is usually driven by aging homeowners, but many people have caught on to the convenience and beauty of a wet room. Whether users are dealing with a broken leg or a more permanent physical challenge, curbless showers allow greater ease in access. That’s why many bathtubs are being replaced with showers, often designed as walk-in showers. “As manufacturers develop more methods to create these showers we continue to see an increase in their use,” says Karen Richmond. “Curved walls and platforms tend to be more dynamic for level changes, material changes, and so on,” says Kathleen Donohue. 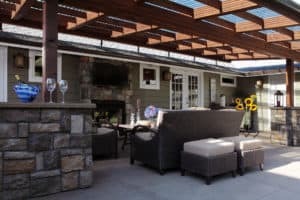 “Whether it’s the parents moving in, the kids coming home from college, or the need for a flexible, rentable space, more and more people are using an ADU to maximize the living space on their property,” says Portland Design Consultant Matt Sipes. Alex Christopher and Aaron Ziltener contributed to this article.